EMF protection is extremely important and not easy to achieve. About a year ago, a friend told me that there are some natural materials such as aluminum, copper and mylar, which supposedly block EMF. I have written about aluminum in another article which you can check out. As far as mylar and copper go, are they effective enough to block EMF? First, let’s start with mylar. Can Mylar Help You Block EMF Radiation? Mylar is very good at helping you shield yourself from EMF radiation naturally. The thing to keep in mind is that it blocks radiation only if it’s placed between you and the source of EMF. It definitely has an astounding EMF blocking capability, so the return on investment will always be amazing. However, don’t expect a 100% radiation blockage. It will be around 90-95%, which is still pretty good. So, it helps a lot to use mylar for blocking EMF radiation. You can easily find Mylar blankets on Amazon and other sites. They are very inexpensive and are worth trying out. How Much Radiation Does Mylar Block? If you want to check for yourself and see how much radiation is blocked by mylar, then it would be a good idea is to acquire an EMF meter. With an EMF meter, you can easily compare the readings with and without mylar and this can give you a direct measure of its effectiveness. Check out my recommended EMF meter reviewed. In most cases, you will observe 95% blockage which is highly acceptable. Here is a test video showing how effective mylar is at blocking EMF. Some people consider Mylar better than shielding paint. But, its capability as a permanent solution is questionable. If you need a permanent solution to the radiation problem, then shielding paint (Amazon link) might very well be the option. It all comes down to finding the right approach as you identify what best works for you. Can Copper Block The EMF Radiation? If you use Copper in the form of a copper mesh, you can block EMF radiation without much of a problem. This will help you shield most types of radiation. The great benefit here is that Copper is great at shielding radio frequencies and magnetic waves. Copper is one of the best metals that you can use if you want to block or shield EMF radiation naturally. That is because it’s good at attenuating electrical and magnetic waves naturally and with great success. It can be used in server rooms, computer equipment, hospitals and so on. If you want to block EMF radiation, you can easily see copper used in the wire meshes as a powerful radiation blocker. It will work quite nicely if you use it adequately, and the best part is that you can tackle any type of radiation with it, be it microwave or radio. The thing you have to realize here is that the thickness of the copper mesh doesn’t matter. The holes don’t need to be bigger than the wavelength as that’s what helps block everything. This is a nod to the Faraday cage which offers the best EMF blocking capability. Usually, the Faraday cage also has aluminum foil and having both that and copper can indeed pay off quite a lot. Aluminum, copper and mylar are extremely good at shielding EMF radiation. But they do fully absorb it, which is something to take into consideration. 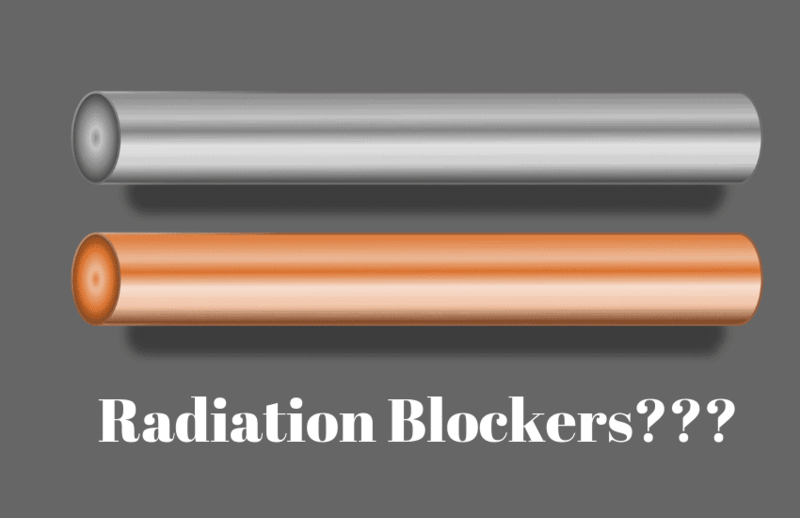 Can You Use Copper And Mylar For EMF Blocking? As I mentioned above, mylar and copper are great at shielding you from EMF. They are not going to fully block radiation but then, no material in the world will be able to block 100%. Copper is considered a bit better when compared to mylar in regards to blocking EMF radiation, but both of them are pretty impressive. Just consider giving any of these materials a shot if you want to reduce EMF radiation in your house. If you use copper meshes and films in your home on the windows, effective EMF shielding is guaranteed. There are other areas of the house also where you can use it to block EMF. Adaptability is key, and that’s why you have to find new and creative ways to use copper and mylar in your home to block EMF. It doesn’t have to be over the top or super complicated. Most of the time simplicity is key, and it can do wonders for you if you know how to manage it the right way. For example, you can design simple covers for your electronic equipment using mylar blankets, which are inexpensive. A good idea is to turn off your phone during the night if you can. Getting rid of the microwave oven or using it sparingly is always going to work very well too. Using Wi-Fi less than you already do is another way to limit exposure. Put Ethernet cables in your home instead of using wireless. Yes, it might be more convenient to have Wi-Fi, but it’s full of radiation, and that can be one of the main things that you want to combat. I also recommend you to avoid placing your cell phone against your head. Use the speaker or headphones as much as you can. Even laptops and tablets emit EMF radiation, so the less you use them, the better it will be. Mylar can help you quite a lot as you try to combat all these radiation sources. Sometimes it will work very well, other times less so. But if you are fully dedicated to the process, you will find that it’s a lot easier to remove radiation from your home naturally. Keep in mind that microwaves, phones, laptops, and electronics, in general, are huge sources of radiation. That’s why the best thing you can do is to stay away from them as much as you can. It will be worth it if you focus on that in the long run. Thanks for reading! Before you go, check out my recommended products for EMF protection.